In lesson 11, we looked at God’s design for women who are wives. Lesson 12 focuses on the beauty of being a godly mother. 1. In lessons 2 and 3 (links above) we took a look at some of the attributes of a godly mother that we can emulate. What are some of those attributes or character traits from Proverbs 31? In today’s lesson, rather than attributes to emulate, we’ll be focusing on God’s instructions to obey for mothers. We’ll examine how we’re to regard motherhood and our children, how we’re to train our children in godliness, how we’re to discipline our children out of ungodliness, and the example we’re to set for our children. Some of these instructions can also apply to childless women in their relationships with their spiritual children (i.e. younger women or children they disciple) and others. As you read over today’s passages, explain how childless women might apply some of these Scriptures. 2. Examine the first three passages (Psalm 127-Titus 2) together. What do these passages say about how we are to regard motherhood and our children? What should the attitude of our hearts be? In what sense are children a reward? How do we know that Psalm 127:3 does not mean that if you act in a way that pleases the Lord He will reward your good behavior with children? What does this verse mean? Is loving your children (Titus 2:4) simply a feeling of affection toward them? If so, why would young women need to be trained to love their children? When you finish today’s lesson, come back to Titus 2:4 and give a fully-orbed biblical definition of what it means to love your children. To whom are the Colossians and Ephesians verses addressed? Does this mean they don’t apply to mothers or that it’s OK for mothers to provoke their children, but not fathers? If they apply to both parents, why are they addressed to fathers? How are we not to deal with our children according to these verses? What does it mean to provoke your children? Why are we not to provoke them (Colossians), and how are we to deal with them instead (Ephesians)? Compare Ephesians 6:4b to the Old Testament verses in this section. How are they similar? 3. Examine the next three passages (Proverbs 29-Deuteronomy 21) together. What is the purpose of godly discipline? What are the biblical definitions of the words “discipline” and “reproof”? Are discipline, reproof, and training the same as punishment? Why or why not? What are some of the consequences of disciplining your child? The consequences of refusing to discipline your child? According to Proverbs 13:24, what motivates someone to discipline her child? What motivates someone to refuse to discipline her child? Are “love” and “hate” simply emotional feelings in this verse or an attitude, posture, or orientation of mindset toward the child? Look closely at Deuteronomy 21:20. Is this passage most likely talking about a very young child or an older child/teenager? According to the Deuteronomy 21 passage, does godly discipline always result in an obedient son or daughter, or can there be exceptions to the rule? Why is it important to both train your child in godly ways and discipline him out of ungodly ways? Explain how this fits into the “put off the ungodly, put on the godly” model of biblical sanctification. 4. Examine the last five passages (Deuteronomy 21-Matthew 10) together. What do these passages teach us about the godly example we need to set for our children? Sometimes we see implicit instructions to parents in passages that explicitly teach children how to treat and regard their parents. For example, if there were a verse that said, “Children, love your parents,” we could learn from that verse that we need to act in a way (lovable) that makes it easier for our children to obey that Scripture. Considering this concept, look at the Exodus 20 and Proverbs 1 passages. If your children are to honor you, in what manner should you behave? What should your teaching be like if your children are not to forsake it and to consider it a “graceful garland” and a “pendant”? What is the context of Ezekiel 16? To whom is the parent/child metaphor in this passage addressed? Explain the phrase “like mother, like daughter”. Why is it important to set a good example for our children with our own behavior, and why was this a good metaphor for God to use in addressing Israel’s unfaithfulness to Him? Examine the Deuteronomy 21 and Matthew 10 passages together. What is to be a mother’s highest priority – her relationship with her child, even the life of her child, or her love for, obedience to, and loyalty to Christ? Do you love Christ more than your child? If you had to choose between your child and Christ, whom would you choose? What message does it send to our children when we show and tell them that we love Christ more than we love them? How can you demonstrate to your child that your highest love and loyalty is reserved for Christ? If you’d like to discuss this lesson with other women who are participating in the study, join our Imperishable Beauty Bible Study Discussion Group on Facebook. Examine each of the instructions in Deuteronomy 6:6-9. Make a list of practical ways your family could put each of these instructions into practice and discuss it with your husband. Together, pick one of these practices and implement it with your children this week. …they all walked sedately into the church. The first clang of the bell rang out when they were on the steps. After that, there was nothing to do but sit still till the sermon was over. It was two hours long. Almanzo’s legs ached and his jaw wanted to yawn, but he dared not yawn or fidget. He must sit perfectly still and never take his eyes from the preacher’s solemn face and wagging beard. Almanzo couldn’t understand how Father knew that he wasn’t looking at the preacher, if Father was looking at the preacher himself. But Father always did know. A hundred and fifty-ish years ago, this is how children were expected to behave in church. I love a good sermon, but I’m not sure even I could meet those behavioral expectations, and, these days, I certainly wouldn’t expect my children to. But fast forward from the 1800’s to 2015, and think about how you may have seen some children behave in church. It’s quite a bit different from Almanzo’s experience, wouldn’t you say? I don’t think we need to dial things back a hundred and fifty years, though. A little fidgeting, a Bible dropped loudly on the floor, a few seconds of wailing while you frantically search for the lost pacifier, a bit of jabbering, none of these things are a big deal. But neither should a toddler be allowed to run up and down the aisles of the sanctuary for the bulk of the sermon. Eight year olds do not need to be crawling around on the floor between the pews playing with toys. Twelve year olds can reasonably be expected to stay awake, sit still, and pay attention during the service. We expect our children to obey us (and other adults) and behave properly in a variety of places: school, the grocery store, restaurants, on their sports teams, at scout meetings. Why, when the worship service is far more important than any of these, would we not require them to act appropriately in church? And when we require them to behave themselves in all these other venues but not in church, what are we teaching them about the importance of church, reverence, God? But, if you’ll determine in your heart to train your child to control himself and behave appropriately during church, you might be surprised at all the blessings and benefits you encounter along the way. What is appropriate church behavior? That’s going to vary by age. Obviously, a three year old isn’t going to sit perfectly still for thirty minutes and take sermon notes. But, believe it or not, you can start (and I would strongly recommend) training your child from infancy that church is a place where we sit still, sit quietly, listen when it’s time to listen, and participate when it’s time to participate. How do I train my child? 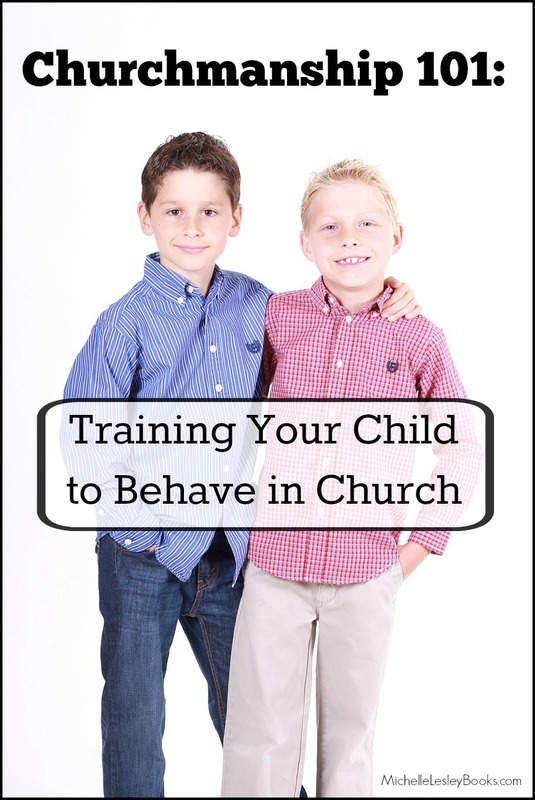 The first and best way to train your child is by modeling proper church behavior yourself. Does he see you singing enthusiastically during the worship time? Are you checking your makeup or Facebook during prayer? Are you visibly paying attention during the sermon? Constantly talking to your husband or a friend during the service? Your child will imitate what he sees and take his cues from you as to what is acceptable behavior. Otherwise, you train your child in church the same way you would train him in any other situation. If you were at a restaurant, and your baby was crying incessantly, you would tend to his needs at the table, or, if you couldn’t, you would take him out to the lobby or outside until he calmed down. The simple act of doing so begins to plant the idea in his mind that a certain level of behavior is expected in that venue. If your school aged child won’t sit quietly in his seat at school, the teacher administers the appropriate discipline, and, possibly, you do too, at home. It’s the same way at church. You let your child know what is expected of him behavior-wise at church, praise him when he does well, and administer discipline when he disobeys. If your church offers a nursery, there’s no shame in making use of it. As a stay at home mom, I well remember the days when church was the only opportunity I had for a small breather from my children, adult fellowship, and hearing God’s word without interruption. But if you want to have your infant or toddler in church with you, that’s great! Be sure your diaper bag is well stocked with anything you might need to keep a little one relatively still and quiet. Bottles, pacifiers, small snacks that won’t make too much of a mess, some small, soft toys (such as stuffed animals or board books- maybe even a special one that’s only for Sundays) that he can quietly play with in his lap. Try to choose a seat on the aisle near a door in case you need to make a hasty exit. Also, try to sit somewhere where any noise your child might make won’t be picked up by the pastor’s (or other) microphone. Sometimes well meaning Sunday school teachers serve sugary snacks or other foods/drinks that might make your child jittery. If so, it may be more difficult for him to sit quietly during church. Check out the snack situation in your child’s class, and serve him a breakfast that won’t give him the fidgets. Make a bathroom/water fountain pit stop before the service a weekly habit. If your child would benefit from running a lap or two outside before the service to work off some energy, make that part of the weekly routine as well. Dress your child appropriately, yet comfortably for church. I still remember scratchy lace on some of my childhood Sunday dresses. And sitting up against the back of a pew or chair wearing a dress that ties in the back? Absolute torture when that knot dug into my spine. It’s kind of hard to sit still when your entire outfit is conspiring against you. Get them started on taking notes during the sermon. Give your preschooler some crayons and paper and help him listen for something in the sermon he can draw a picture of (a sheep, Jesus, an angel, a garden…). Lower elementary aged children might enjoy taking “tally mark” notes. Make a brief list of words your child is likely to hear during the sermon (God, Jesus, Bible, Love…) and instruct him to make a tally mark next to the word any time he hears it during the sermon. Some pre-readers can even attempt this if you draw a couple of small pictures instead of words (a heart for “love,” a cross for “Jesus,” etc.) Before church starts, try to guess with your child which word will get the most marks. After church, count up the marks and see if you were right. You may even want to do your own tally mark sheet during the sermon to model for your child what you want him to do. Some churches offer a fill in the blank sermon outline in the bulletin. This is a perfect note taking activity for older children and tweens. They can also be encouraged to turn in their Bibles to all the Scriptures the pastor mentions, copy down a verse from the text of the sermon, or write down any questions that occur to them as they listen. And, speaking of questions, another fun activity is for each family member to write down a couple of questions, and their answers, from the sermon. Then, in the car on the way home, each person gets to ask his questions. Whoever gets the most correct answers gets to pick what’s for lunch (or bragging rights, or something else fun). It’ll keep EVERYONE paying attention, and it’s a great way to reinforce and discuss the sermon. Attend church every Sunday. Not only is it biblical to attend faithfully, but children thrive on routine, and it will be easier for them to remember how to behave if they’re learning and practicing those behavior skills weekly instead of in a “hit and miss” fashion. Training your child to behave well in church isn’t easy at times. I know. I have 6 children and we have raised all of them in church. But if you and your husband will invest the time and effort, everyone benefits. Your pastor will be able to preach uninterrupted. Your fellow church members will be able to worship undistracted. Once your child begins to behave himself better, you will be able to focus more on the service and be less frazzled. But most importantly, your child will develop the skills necessary for hearing and paying attention to God’s word being proclaimed, and what a blessing that will be to him now, and for the rest of his life. to help your child behave in church? This article was Originally published under a different title at Satisfaction Through Christ. It’s a funny thing about parenting articles– they’re always written by doctors or psychologists or parents, never by the people being parented: the kids. I mean, think about it, if you were a waitress and you wanted to know how to serve your customers better, would you take advice solely from other waitresses, restaurant managers, and the guys at corporate? Wouldn’t you, at some point, want to hear from the people you actually serve regarding what they want out of a waitress? So how come we never ask our kids what they want out of a parent? The interview consisted of one question: What advice would you give to parents? M (18 year old daughter) has spent the year since she graduated from high school teaching pre-schoolers at a Christian day care, so much of her advice is drawn from that experience. She has learned a lot about parenting that will help her to be a great mother some day. Don’t be scared to discipline your child. Children need discipline, and that’s part of your job as a parent. Kids are smarter than you think they are. Take the time to work with them.You’ll be amazed at how much they can learn! Giving in to tantrums will ultimately make parenting more difficult because you’re teaching your child that tantrums work when they want to get their own way about something. When considering names for your baby, imagine one of your adult friends introducing himself with that name. If the name doesn’t work for an adult, consider another choice. Also be aware of any acronyms or foul words your child’s initials might spell. Before buying your child any DVD, watch it several times to make sure it doesn’t drive you nuts. No child ever died from a dog licking him in the face. A little sugar from time to time isn’t going to kill your child. Teach your kids not to be aggravating to other kids. Don’t let your kids date too early. Don’t force foods on your kids that they have either tasted and don’t like or think they won’t like. Don’t make your kids write your blog articles for you. It’s pretty boring for them!!! Have a large Christmas budget. Buy your kids go carts. Set a good example for your kids. Spend more time with your kids. More bacon. Also, more junk food and cokes. Let us do good April Fool’s tricks. Mud fights whenever we want. Don’t make your kids go to school. Be less demanding and don’t criticize your kids. Awesome parenting advice, no? Maybe my husband and I should just change all our rules around to fit what the kids want. After all, going back to our waitress analogy, the customer’s always right, right? The Bible says in Ephesians 6:1 (a verse every child in our family memorizes as a toddler) “Children obey your parents in the Lord, for this is right,” not “parents obey your children.” If we decided to become the parents they wanted, we’d have a bunch of naked, bacon-snarfing, go cart riding, uneducated pranksters who stay up until midnight. The reason God gave children parents is so that we can exercise the wisdom, experience, and discernment they don’t have but so desperately need. As godly parents, my husband and I must listen to our children and take to heart anything that is wise or biblical (“Set a good example for your children.” “Never lie to your children.”) and say a firm “no” anything that isn’t (large Christmas budgets and living room streaking). Because God has told us to train our children up in the way they should go (Proverbs 22:6), not the way they want to go. sign around its neck saying, “I ate a tube of Desitin and barfed all over the new carpet during my family’s dinner party.” The funny thing to me is that the dog usually looks like he’s not the least bit sorry, and he’s certainly not ashamed. We can have a good guilt-free laugh at these silly pictures, because the dog has no idea what’s going on and isn’t feeling humiliated in the slightest. But what about the shaming of human beings? Shaming as a form of punishment is nothing new. You read The Scarlet Letter in high school right? You’ve seen pictures of a one room schoolhouse with a child sitting in the corner wearing a dunce cap? More recently, we’ve seen judges sentence petty criminals to stand in a public place holding a sign confessing their crimes. But lately I’ve been seeing a parenting trend that isn’t funny or appropriate, especially for Christian parents: kid shaming. This barber offers parents free “balding man” haircuts for their misbehaving children. This mom went to school with her teen-aged daughter, mocking, taunting, and videotaping her for skipping class. If a child were doing this kind of thing to another child, we’d call it bullying, and everyone would be appalled. But if a parent does it and posts pictures of it on social media she’s hailed as an innovative disciplinarian. Does kid shaming work to modify a child’s behavior? Sometimes. But as Christian parents, we are not called to merely modify our children’s behavior. We are called to cultivate the soil of their hearts, so that those little hearts may one day be fertile ground, ready for the seeds of the gospel and godly discipline. And shaming or humiliating a child doesn’t enrich that heart soil. It hardens it. Children need discipline, but they need us to discipline them in a godly way. How do we discover the godly way to discipline? By following God’s example laid down in His Word. There are many reasons God presents Himself to us in the Bible as our Father. First, and foremost, it describes our relationship to Him: the depth of His love for us, His desire for what’s best for us, His authority over us. Our love for and dependence on Him, our desire to obey Him. But, secondly, God revealing Himself to us as our Father gives us a beautiful, perfect model to follow in parenting. Want to know how to love your child? Look at the way God loves you. Want to know how to provide for your child? Look at the way God provides for you. And if you want to know how to discipline your child, look at the way God disciplines His children. Does God shame and humiliate us when we sin? No. He does not shame us into repentance, but draws us with His kindness. Sometimes God’s discipline is pretty intense, but it is always done in love and always to draw us away from sin and back to holiness, never to demean us. Our children are a precious gift, entrusted to us by God. We are to reflect God’s character to them as we walk with Him and seek to love and discipline them His way. Choosing a worldly way of correcting their behavior but not tending their hearts, well…that would be a shame. These kids today! Every generation since Adam and Eve has probably said it. Certainly today, you can’t throw a rock out the window without hitting half a dozen ill-behaved brats. We’ve all cringed at the temper tantrum-throwing child seated at the next table in the restaurant, or watched a mom in the store tell her little sweetie “no” a dozen times, only to finally give in to his demands. Heck, most of us have probably been that mom on occasion. Hundreds of books, both Christian and secular, have been written on the topic of how to discipline children, but much rarer are the writings about why we should discipline them. As always, the easy answer to that question for the Christian is: “because God said so”. But why does God tell us to discipline our children? Because discipline teaches our children that we love them. The most important way we can love our children is to lead them to salvation. Learning obedience to parents not only teaches them about sin, law breaking, punishment, and repentance, it also teaches them the concept of setting aside their own desires in favor of submitting to the authority that has been placed over them. This has direct application to the spiritual construct of salvation. Salvation does not take place until, through faith in Christ, we repent of our sin and submit our will to the authority and Lordship of Christ and commit to follow and obey Him. First John 4:20 says: “If someone says, “I love God,” and hates his brother, he is a liar; for the one who does not love his brother whom he has seen, cannot love God whom he has not seen.” I really believe this principle generally applies to obedience as well. One of the things I tell my kids when I discipline them is that, although I don’t enjoy punishing them or letting them suffer the consequences of their actions, I have to do it because I want them to start learning, through obeying me, how to obey God. I’m flesh and blood standing right in front of them, clearly telling them what to do and what will happen if they don’t obey. If they can’t obey me, how in the world are they going to learn to obey God, whom they can’t see or hear with their eyes and ears? Conversely, if a child has been lovingly and consistently disciplined, how much easier will it be to introduce him to the concept of submission to God’s authority? Another vital spiritual principle that discipline helps teach is an understanding of sin, its consequences, and punishment. A child who has been disciplined knows what it means to be guilty of breaking the rules. He also knows that because he has broken a rule, some sort of undesirable consequence will follow swiftly. A child who has not been disciplined believes he does no wrong and that the world around him should be catering to his wants and demands. Which child will be able to grasp the idea that he is a sinner in need of salvation? Which one will understand contrition, eternal punishment, and eternal reward? Teaching obedience also teaches our children that we are concerned about how they fare with others. My children have come to me in the past and told me that they don’t like being around certain friends of theirs who constantly misbehave. On these occasions, I very carefully (to ensure that they don’t become critical or develop an attitude of superiority) explain to my children that this is one of the reasons Daddy and I teach them good behavior. We don’t want them to experience the sadness that misbehaving child is sure to feel when he realizes that people don’t want to be around him. We teach them that we love them enough to want others to delight in them. Discipline shows love for our children through concern for their safety. If my child doesn’t obey me when I tell him not to run into the street, he could be killed by an oncoming car. If he runs into the street and then stands there and argues with me when I tell him to get back on the sidewalk, he could also be killed. Many years ago, when I was teaching school, a kindergarten student of mine was killed in a house fire. He didn’t die because he was unable to get out of the house. He was rescued, unharmed, and was told not to go back into the house. 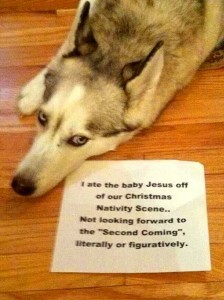 This little boy, notoriously disobedient, went back into the house. He died as a result of lack of discipline. I have told my children these stories on occasion, not to scare them unnecessarily, but to show them just how serious the consequences of disobedience can be. All the spiritual principles in the world won’t matter if a child isn’t alive to learn them. 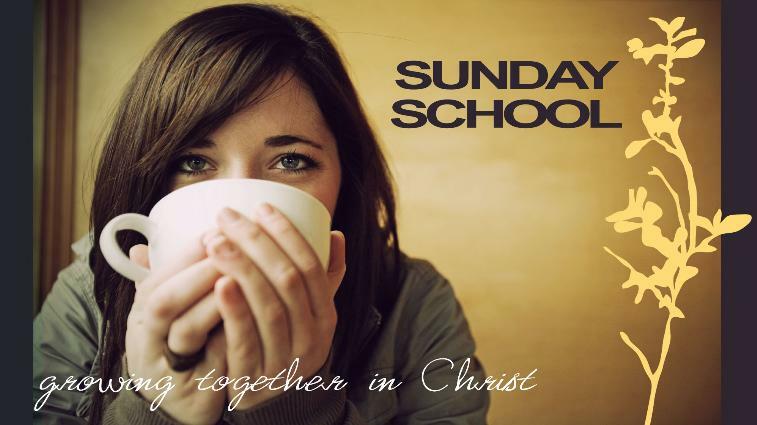 This is the second installment of our series Churchmanship 101.
under a different title at Satisfaction Through Christ. These are my notes from my ladies’ Sunday School class this morning. I’ll be posting the notes from my class here each week. Click here for last week’s lesson. This week we looked at seven New Testament epistles, all, except 1 Peter, written by Paul. All were written to encourage and/or instruct churches and pastors in doctrine and practices as they lived out the Christian life in the church, at home, and in the world. Four of these seven epistles specifically instruct family members on their roles in the home. Today, we’re going to take a look at God’s instructions to wives, husbands, children, and parents. We’ll be using Colossians 3:18-21 as our outline, fleshing out each role with passages from the other epistles. Interestingly, in each of the four passages we’ll be studying today, the roles in the home are addressed in the same order: wives, husbands, children, parents. It’s of particular interest to me that wives are always addressed first. Although Scripture doesn’t tell us why this is the case, I would speculate that this might be for two reasons. First, it follows the order of the Fall (Genesis 2). Eve fell first, then Adam, and God gave her consequences first, then Adam’s. Second, wives -then and now- normally have the most responsibility for the day to day, “in the trenches” management of the home. We have an enormous impact on the emotional and spiritual tone of our marriages and family life. We are submit to our husbands because it is “fitting in the Lord.” Not because they deserve it. Not because they’re awesome (and when they’re not we don’t have to submit). Not because we want to be the perfect wife. Because it is “fitting” in God’s eyes. This is the role God has ordained for us, and it honors Him when we obey Him. We are to submit to and respect our husbands as a picture of the church’s submission to Christ. In the same way that Hosea’s marriage to Gomer was a picture to Israel of God’s faithfulness to His adulterous people, our submission to our husbands should be a picture, especially to the church, of how the church is to be faithful and obedient to Christ. We are to be subject to our husbands to win them to godliness– to salvation if they are lost, to obedience to Christ if they are saved. Notice that this is accomplished by our example and behavior, not by nagging or talking them to death. Our “respectful and pure conduct” and our “gentle and quiet spirits” are attractive and winsome and can smooth the way for our husbands to desire to be more godly men. We are to submit to our husbands “that the word of God may not be reviled.” Lost people are watching us. Will we live in obedience to God’s word and show them that it proves true? That they can trust the same Christ we trust? Husbands are to love their wives and treat them kindly. The Greek form of the phrase “do not be harsh” means not to be bitter or resentful. Wives are imperfect, sinful people (just like husbands) and husbands are to be merciful and forgiving when their wives fall short, not hold bitterness or resentment against them. Husbands are to love their wives as a picture of Christ’s love for His bride, the church. Christ gave both His life and His blood for the church. When husbands daily love their wives in a self-sacrificing way, they are showing the world -and the church- Jesus. Husbands are to be understanding with their wives and honor them because they are brother and sister in Christ. Just as a rift between two fellow Christians can hamper their worship and church unity, sinning against his wife by failing to love her as Christ commanded will hinder a man’s relationship with the Lord. Children are to obey their parents. In everything. They are not to be allowed to back talk or do as they please in defiance of their parents. Why? It’s so simple even a child can understand it: this pleases the Lord. When children obey their parents, they are fulfilling the role God has ordained for them. Ephesians 6:1-3- Obey because it’s right. Obey for your well-being. Obedience to parents is right because God says it is. It is His very first “horizontal” (our relationship with others) Commandment in the Decalogue (the first four are “vertical”- our relationship with God). It is also the first Commandment with a promise- that things will go well for those who obey it. Whom does Paul address in this statement? Fathers. While mothers have a huge responsibility to train their children in godliness on a daily basis, the buck stops with Dad. God has been holding dads responsible for their families since He called out, “Adam, where are you?” in the Garden. Fathers are not to rule with an iron fist, but encourage and grow their children in the ways of the Lord. Paul again addresses fathers. Fathers are to take seriously their responsibility for the spiritual health of their families. They are not to act or treat their children in ways that frustrate them needlessly. Fathers are to train their children in the Scriptures and discipline them biblically. This is the only part of these passages where Paul specifically addresses a mother’s relationship with her children. She is simply to love them. Of course, it is not loving to let a child do as he pleases. We have already seen that God commands children to obey their parents. So a mother is to lovingly train her child in God’s word and in obedience to God and to parents. 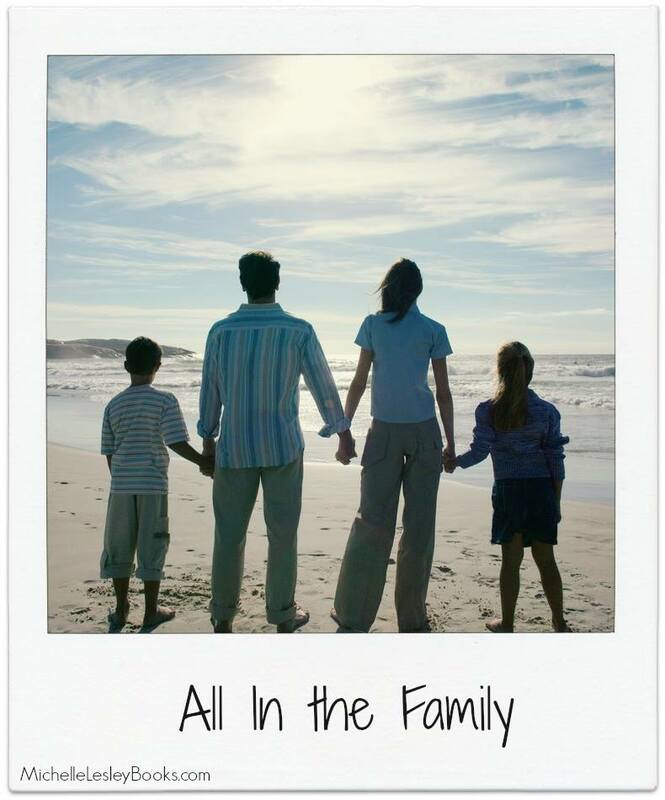 In His wisdom and goodness, God has ordained certain roles and responsibilities for each member of the family. We show our love and honor for God when we seek to obey Him by fulfilling our roles as He empowers and enables us to do so. David’s Sin: You da Man! How could David, a man after God’s own heart (1 Samuel 13:14), sink to the level of committing adultery and murder? What was he thinking? How did he respond to being confronted by Nathan? What can we learn about how to deal with our own sin? As we’ve read about David’s previous battles, where did we always find David when the fighting was going on? Back at the palace? No. He was out there with his men, leading things. This time, he was somewhere he wasn’t supposed to be. Can you think of a time when you were somewhere you knew you shouldn’t have been, which led to temptation? Both Eliam and Uriah were part of David’s mighty men. These weren’t just nameless, faceless Joe Blows in his army, but part of his inner circle who had been with him through thick and thin with fierce loyalty. Lest there be any question that maybe this was Uriah’s baby after all, verse 4 makes clear that the reason David saw Bathsheba bathing was that she was cleansing herself after “that time of the month.” David took her afterwards and Uriah was miles away at the battle, so only David could have been the father. (If you don’t know what that means, you’re not old enough to remember “The Newlywed Game” from the 1960s-70s. YouTube it.) “Go down to your house and wash your feet.” Since washing was done right before bed, this idiom meant for Uriah to go home and enjoy “knowing” his wife in the biblical sense. Uriah, possibly inspired by David’s past honorable leadership, acted more valiantly and loyally here than his king did. v. 4, 26- A willing participant? Notice that this passage doesn’t tell us anything about what Bathsheba was thinking or feeling about all this. Remember, David was the king. You didn’t say no to the king if you wanted to live, especially if you were a woman. And furthermore, she knew he was “God’s anointed.” Surely such a man wouldn’t lead her to do anything wrong, would he? So, even if Bathsheba had been attracted to David, there was some level of coercion and advantage taking going on here on David’s part. Verse 26 makes a special point of telling us that she lamented over her husband. She loved him. David didn’t just sin with Bathsheba, he also sinned against her. I think in this case, the HCSB captures this verse better than the ESV (my preferred/usual translation): “The Lord considered what David had done to be evil.” That pretty much sums up what David had done, and it sums up our sin in God’s eyes as well. Evil. 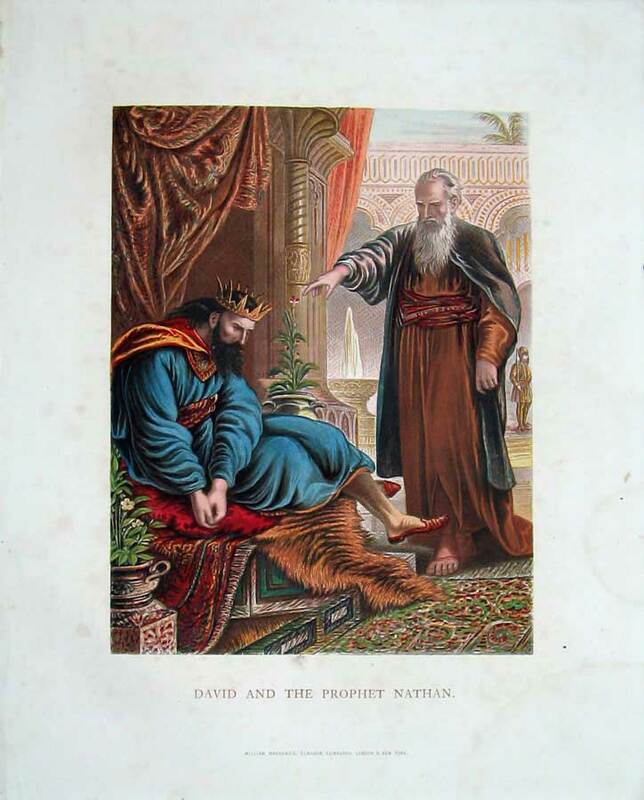 Nathan wasn’t just a prophet; he was David’s friend and adviser. 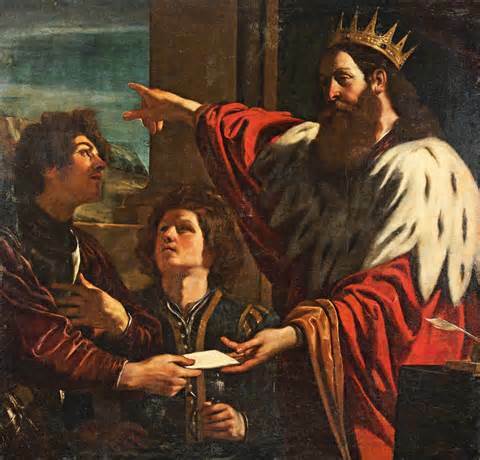 God sent him to confront David about his sin, and gave him the wisdom and the words to do it in exactly the right way. The rich man represented David. The poor man represented Uriah. The lamb represented Bathsheba. What do you think the traveler represented? The traveler represented David’s temptation. Temptation is a lot like a visit from a traveling salesman. It comes and goes, it shows up unexpectedly, and it always tries to get you to spend more than you want to on something that seems fabulous but never lives up to the hype. When temptation rang David’s doorbell, he flung open the door and welcomed it in as an invited guest. As new creatures in Christ, we don’t have to do that. 1 Corinthians 10 says God will always provide a way for us to escape temptation. One of those ways of escape is to not be home to answer the door. As I mentioned earlier, David wasn’t even supposed to be home when that temptation came around. He was supposed to be out on the battlefield with his troops. One way to avoid temptation is to be where you’re supposed to be and not be where you’re not supposed to be. We also see in verse 4 that the rich man not only refused to send the traveler away and welcomed him in, but he also slaughtered a lamb to feed the traveler. The Israelites did slaughter lambs for food, but what else did they slaughter lambs for? Sacrifices. David didn’t just welcome temptation in, he sacrificed for it. He was no longer sacrificing to honor God, but to gratify his own selfish desires. He sacrificed things that belonged to him—his integrity, his morals, his reputation, his example to his people, and his relationship with God. But he also sacrificed Bathsheba and Uriah who did NOT belong to him. What are some ways we might sacrifice things, or others, for sin? “He had no pity.” David never considered how his actions would affect Uriah and Bathsheba. He only thought about himself. Temptation and sin blind us to what we’re doing to ourselves, others, and God. Nathan confronted David wisely. Remember, David was the king—he could do (and had done) whatever he wanted to do, and he had already killed one man. Nathan knew this going in. Nathan also acted lovingly, boldly, and firmly. His commitment to what God had told him to do was greater than the love of his own life (John 15) or the love of his relationship with David. How often do we look the other way to keep the peace or preserve a relationship with someone instead of obeying what God has told us to do? I, I, I, I… Notice how many times God refers to Himself in these three verses? He is making it clear—and David gets the message as we will see in Psalm 51:4—that it is primarily God against whom David has sinned. Though others may be casualties or collateral damage (as Uriah and Bathsheba were), when we sin, we set ourselves up as enemies of God and wage war against Him. If all God had blessed him with had not been enough, God would have given him more. The fact that God had not given him more shows us that God had given David exactly what He wanted him to have. But David was not content with all the blessings God had given him. He selfishly wanted things God didn’t want him to have. “Despised” and “evil”- When we sin, no matter how “small” it is, we are showing hatred for God’s word. Hating God’s word is evil. Notice in v. 9, “you have despised the word of the Lord,” and in v. 10, “you have despised me.” To despise God’s word is to despise God Himself. Why did God discipline David publicly when he had sinned privately? First, David had not sinned completely privately. Many people knew at least part of what he had done: the servants he sent to take Bathsheba in the first place (4), the servants who were in the house at the time(s) of the affair, Joab, likely several of the soldiers serving directly under Joab and with Uriah, probably the messenger who brought word of Uriah’s death, Nathan, and of course, Bathsheba herself. And you can bet that a lot of those people didn’t keep what they knew to themselves. “Your sin will find you out,” (Num. 32) is certainly true, especially for sins of this magnitude. With all those people knowing what David had done, how would it reflect on God if He disciplined David privately? It would look as though God had given him a pass, that certain, special people were above God’s law. That’s how things were for kings of pagan nations. Israel and Israel’s God were different, not like the other nations. Furthermore, it would have diminished God’s justice in the eyes of Israel if God disciplined David privately and Israel couldn’t see it. How could they trust His justice if it looked like His justice was inconsistent? Second, David was famous, highly visible. Like it or not, he set an example for the people. When he did right, it was a good example. Here, he did wrong and it was a bad example. Through his actions and God’s visible discipline, the people learned what not to do in their own lives. Because David confessed his sin and repented of it, God mercifully forgave him. While David had said the “rich man” should die for his sin (5), and David was guilty of crimes deserving the death penalty, God removed that penalty from him. The consequences of his sin would remain (the death of the baby), but the punishment was taken away. and you teach me wisdom in the secret heart. let the bones that you have broken rejoice. and my tongue will sing aloud of your righteousness.